Skookum Butte Lookout sits atop a large outcrop of Idaho Batholith granite, at an elevation of 7,215 feet above sea level. The Lookout, fabricated in a "Grange Hall" style, was constructed in 1928, and was in regular use until the 1970s. 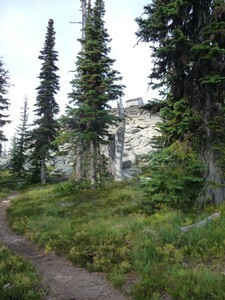 However, although abandoned for fire detection lookout since then, the site continues to be a hiking destination for local Outfitter/Guide services, youth summer camp groups, and the general public. There is a strong, local public desire to preserve the historic property for recreational use. It is one of only two intact lookouts of its kind in the area, and is eligible for placement on the National Register of Historic Places (NRHP); it is already listed on the National Historic Lookout Register. However intact, time and the elements have taken their toll on the historic lookout, and we need your help this summer to get her back in shape!